Petal Talk: Flowers for Spring Bouquets: You Can Grow That! 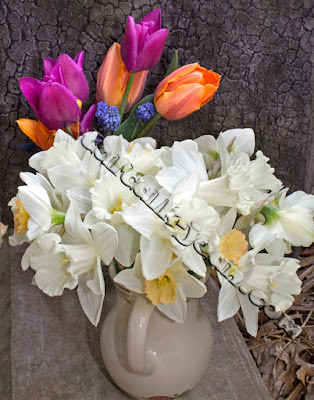 Flowers for Spring Bouquets: You Can Grow That! that wouldn't get along otherwise. It's slightly possible I have more vases than most people. I don't spend a lot of money on them because I find many of them at my local resale shop and at other bargain-hunter haunts. Those I buy typically come from public garden gift shops, and at clay artists I find while on vacation. Whenever I have a few flowers blooming in the garden, I start bringing a sampling in for a stint in a vase. It doesn't matter if their stems are just 4 inches long--I have just the right vase. 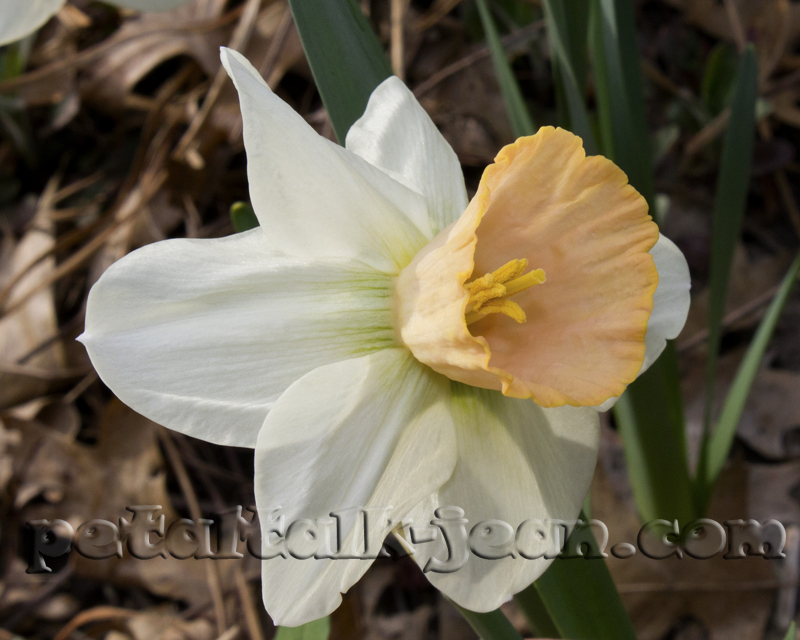 Narcissus are famous for fouling the water the're in. Their stems give off a substance that will shorten the vase life of other flowers. It's recommended they have their own separate vase. But I love them mixed with other flowers. 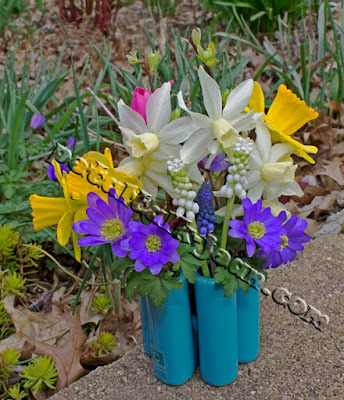 One of the little combination vases I have is the Pooley Puzzle, which features a clutch of tubes that allows you to put different types of flowers, no matter what their vase life or reputation. In this vase, I was able to mix small and large-cup daffodils with blue and white Muscari and Grecian windflower (Anemone blanda). A short-stemmed clutch of daffodils. Luckily, I have hundreds of daffodils throughout all of my garden beds so I can cut lots. I've found it takes quite a few stems to fill a vase. I have a little pitcher that works well for holding shortened stems of daffodils. To make them look like a full bunch, I cut the stems around 6 to 8 inches long before arranging them in the vase. Whether you like to cut bouquets or enjoy the flowers in the garden, make sure to choose early, mid- and late-season varieties. I have a few new varieties, including Berceuse, considered a mid-season variety, this year opening around mid-April. 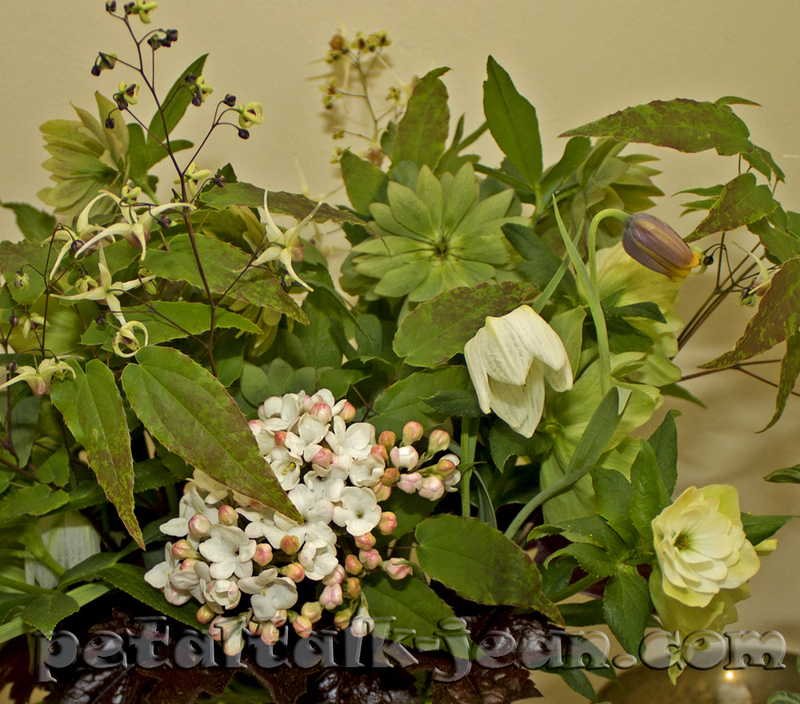 This arrangement includes Hellebores, two types of Fritillaria, Viburnum and Epimedium. One of the longest-lasting bouquets for mid-spring contains Epimedium, Checkered lily (Fritillaria), Lenten rose (Hellebores) and Viburnum. The first to burst its flowers was the Epimedium, but I just snipped the stems off and left the leaves, which remained as perky as the rest of the stems in the vase for a solid week. I changed, or at least topped off the water every two days. Hellebores that are freshly opened don't last very long as cut flowers. I made sure to pick the those that had already dropped their stamens, after which they typically take on more of a green hue, but they're just as pretty. 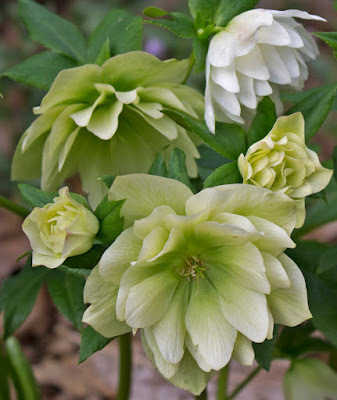 One thing I learned is that if you pick a stem of Helleborus that includes a spent flower and a bud, the bud opens slowly in the arrangement and stays fresh for a few days rather than several hours. Love seeing these flowers again as they have come and gone in my garden. I do like that puzzle vase. It would be very handy now. Plus I like the color.